A.K. Wigg student Zachary McIntire is over the moon. 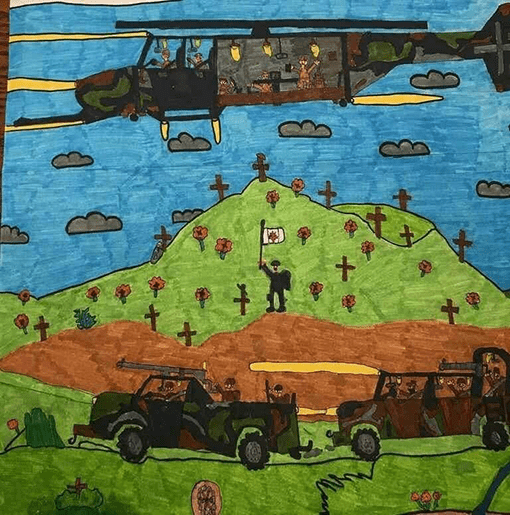 The Grade 4 artist was the only student from the school to create an entry for the Royal Canadian Legion Branch 613 Poster Contest, in which he placed first at the local level in the Junior category. From the branch level, his poster advanced the Royal Canadian Legion Ontario Provincial Command Competition, where he took first place honours in the Junior category. Laughing, McIntire said he likes to create “big art,” hence the reason his poster was a bit bigger than the rest of the entries. One of McIntire’s favourite themes to draw is one of military elements, hence the capturing of his interest in the Remembrance Day competition. His detailed winning piece took some 50 hours to create with fine-tipped markers. McIntire said his family was proud of him. They were “really surprised,” especially at the provincial level placing and are “extremely supportive” of his artistic endeavours. Fucile describes Zachary’s mom as being “extremely artistic.” Fucile has been working with McIntire since he started junior kindergarten and has seen and encouraged his artistic ability. McIntire was presented his provincial accolades the second week in December by Royal Canadian Legion Branch 613 Director Jacqueline Schwenker. Schwenker said the Branch was “shocked” that McIntire, plus two other students, placed at the provincial level. Cole Tresham placed second in the Junior category and Evan Genning placed third in the Intermediate level. 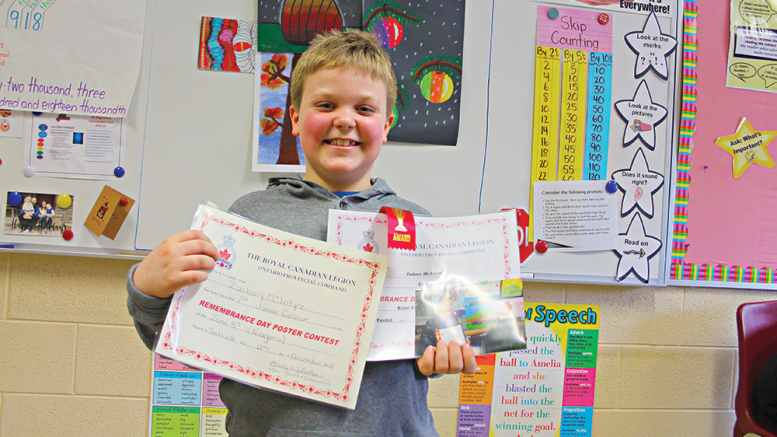 Schwenker is hopeful these advancements by local students will inspire more area students to participate in the organization’s future poster, poetry, essay and public speaking contests. Initial judging takes place at the community level by volunteers at local Legion branches, and the winning entries progress to judging at the provincial level. The winning entries at this level are forwarded to Ottawa, where they are judged, and the national winners declared. The names and work of all the national winners are published in a booklet. The poster contest has two divisions—colour, and black and white. The first place entries for the four categories from each division are displayed at the Canadian War Museum from June to May of the following year. The entries winning second place and those receiving honorable mentions are displayed in the foyer of Parliament buildings during the annual Remembrance period in November.